WASHINGTON — Thousands flocked to the nation’s capital over the weekend to attend two marches with opposing stands on the key social issue of abortion, with Oklahomans among the crowds at both demonstrations. Kelly Allen, a teacher at Bishop McGuinness Catholic High School in Oklahoma City, walked in the March for Life Friday with her students to show them that there are others with pro-life views like them. Heather Bratcher, a Yukon resident, participated in the Women’s March on Saturday because it represents countless social issues she cares about. Allen doesn’t believe the groups attending the two marches need to be in opposition to each other, though. “I’m all about empowering women, and I think they should be,” Allen said. “I don’t see that this takes away from empowering women,” she said referring to the March for Life. Oklahoma has long been a conservative state, but a liberal minority in the Sooner state has surfaced. The two groups represented Oklahoma and the divisions that exist in the state on some social issues over the weekend in Washington DC. 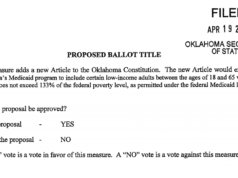 Hardt said the conservative majority in Oklahoma is largely a result of its status as a Bible belt state. She said Oklahomans have been more conservative than their party registration suggests. “Voting and attending church are both civic engagements, and they correlate, so the more likely you are to vote, the more likely you are to go to church, at least in Oklahoma,” said Bill Shapard, CEO of Shapard Research. While the goal of the March for Life is well defined, it’s a gathering of members of the pro-life movement, the Women’s March has eight of what it calls “unity principles” that unite its marchers, with reproductive rights and legal abortion being among them. Hand-held posters and signs were a big part of both rallies, with some protesters bringing creative signs from home carrying mass-produced signs. One person at the Women’s March held up a generic sign from the previous day’s march that had been edited to read “Fund Planned Parenthood” instead of “Defund Planned Parenthood” and “I am the Pro-Love Generation” in place of “I am the Pro-Life Generation,” exemplifying just how far apart these two groups are. In Oklahoma, there might be a space for the pro-life movement and the women’s movement to co-exist, at least the way Christine Pappas sees it. Pappas, a political science professor at East Central University, said there is room in Oklahoma for women who are conservative and pro-life but also consider themselves feminist and that the state might embody the dichotomy better than others. Moore resident Sheena Harrison said she doesn’t think the pro-life movement and feminism go together so easily, though. Amy Frame, another Bishop McGuinness teacher, said she wouldn’t consider going to the Women’s March because it the pro-life cause isn’t supported there. Many of the groups participating in the March for Life were church youth groups and Christian and Catholic schools, like the group of high schools — Bishop McGuinness, Cristo Rey and Mount St. Mary’s — from the Archdiocese of Oklahoma City. A large part of why the group traveled to Washington for the march was to show the group of 30 students that there were more young people that shared their views on abortion. At the national level, young people are trending liberal and Democratic, but Shapard said the same trend is not present in Oklahoma. “Young people here are just as likely to be registered Republican as they are to be registered Democrat, whereas at the national level, they’re much more Democrat, much more liberal,” Shapard said. Oklahoma could be on the verge of change in the future though. Pappas pointed to the election of Kendra Horn in Oklahoma’s fifth congressional district as a sign of a slight potential shift in the Sooner state. However, Shapard said the district is still majority Republican. At the same time, Oklahoma State Senator Joseph Silk recently introduced a bill to criminalize abortion and U.S. Senator James Lankford, who attended the March for Life, supported a recent bill to stop taxpayer funds from being sent to Planned Parenthood. Tiffany and Sheena Harrison, both Oklahoma natives, said they’ve considered leaving the state many times before because its politics don’t match their views, but for now they’ve decided to stay. The major cities — like Oklahoma City, Tulsa and others — are starting to trend Democratic, and the cities are slowly building the kind of urban core that builds liberal views in places like Dallas and Denver.